The ancient 130-year-old Jacob, 17 years before his death, told the ruling Pharaoh of ancient Egypt that “My years have been few and difficult” as he recounted his life’s journey. Jacob was a man who today would be described as “complicated.” He did some dastardly and deceptive things in his life; but, also was a man of great intellect, business acuity, and enormous capacity for loving his very large family. Upon hearing of the passing of Senator John McCain, a plentitude of tributes has poured in from both political adversaries and allies, along with friends, declaring his praise as a soldier, statesmen and family man. Many of the accolades are well deserved especially the ones regarding his service as a POW soldier and the testimony from his wife and children that he was a loving, supportive and committed husband and father. A hero soldier and wonderful family man are laudatory elements of John Sidney McCain. As a statesman and politician, who aligned himself with the republican party, he attempted at times to eschew the extremist element of its member politicians and voters resulting in Senator McCain being named a “maverick” — but also leaving a political record that will be questioned and challenged by historians as being the best for all citizens of the country, especially the ordinary and minority ones. A number of times, McCain rebelled against his party’s position. While campaigning for president in 2008, McCain rejected the false conspiracy notion propagated among republican voters that candidate Obama was a non-US born Arabic Muslim. He, in partnership with a democratic senator, sought to establish campaign reform laws to remove enormous money donations from the electoral process. He also rejected a CIA director nominee, who supervised torture activity, because he was against “torture” as a practice with enemy combatants. Most recently he cast the deciding vote to stop the overturning of the Affordable Care Act. Although, kudos can be ascribed to Senator McCain for taking these positions, none of them had long term or significant policy/law impact as republican activists, politicians and leaders worked to override each of his positions. 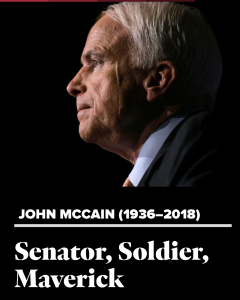 On the other hand, McCain, as a statesman/politician, was a strong advocate for war, an advocate for tax policies that provide advantages primarily and significantly for corporations and the wealthy — while hurting the average and majority of citizens, he routinely felt comfortable using racial slurs to describe non-white people; and early in his political career voted against the creation of MLK, Jr. Day; and was caught using very poor judgment during the Keating banking scandal. Prior to his last days in the Senate, McCain voted with President Trump’s political agenda more than 80% of the time — most likely because of party loyalty and political expediency. I was a resident of the state of Arizona for almost 13 years while McCain was my senator. While I honor him as a man of personal principle, a war hero extraordinaire, and a wonderful family man, his policy and political accomplishments as a statesman did not remove the stranglehold of corporate/wealthy on the political process; did not redress the social/economic/racial circumstances of the average and weakest citizens of the country; and after 30 years, did not turn the country towards a more positive, inclusive one. Sleep on Senator McCain. Take your rest. You are the Jacob of our time. You wrote in your book, that you made many mistakes and did some wrong things. We will remember that your personal life leaves a wonderful example and legacy, while your political life, and though with moments of excitement, leaves much to be debated about its depth of impact.